Amsterdam Evening Recorder, Thursday, September 3, 1908. Amsterdamians, Defeated by Colonials, At Baseball, Vanquish the Representatives of the Same Club in Bowling Match and Bridge Whist Tournament–Buckskin City Team Captures Diamond Cup. About two hundred of the Fort Johnson club of this city, the Colonial club of Johnstown and the Eccentric club of Gloversville attended the outing which was held Wednesday at J. & G. park, Gloversville, under the auspices of the three clubs. The gathering was an enthusiastic one, and was made up of prominent business and professional men of the three cities. Many representatives of the three cities were on hand to witness the knights of the diamond struggle for supremacy. The grand stand was fairly well filled sprinkling of visiting and local club notables. In the field was a veritable automobile show. The Afternoon was devoted to baseball, two games being played. The first game was between the Colonial and the Eccentric teams. The former team won out by a score of 2-1. The second contest was played by the Colonial and Fort Johnson nines. This event was also won by the Colonial team by a score of 11-3. The day’s victory is the second one for the Johnstownians in the contest for the prize cup between three clubs. According to the conditions of the contest the trophy must be won three times in succession before it becomes the property of any of the three clubs. Three years ago the Eccentrics socred one victory in the contest. Last year the Colonials won and followed up the victory with another triumph. Both games were five inning events. The line-up of the first game was as follows: Colonials–James Argersinger, 3b; Rowles, 2b; H. Huchins, lf; H. Stoller, ss; L. Kilmer, 1b; Dorn, cf; Fred T. Ricketts, rf; Walter A. Ecker, c; Bernie Miller, p. Eccentrics–Shotwell, lf; Spencer, p; Edwards, 3b; Hodgson, ss; McLaren, 2b; Becker, cf; Willoughby, c; Muddle, 1b; Danforth, rf. The Colonials scored the first run owing to a wild throw by Dr. Panacci, who substituted for McLaren in the first inning. The second run was gained on an over-throw from Muddle from first base to Willoughby at the home plate, Johnson, the runner, getting the best of a close decision. A question arose among the spectators as to the correctness of the ruling, but it was generally conceded that the decision was a fair one. To Hodgson belongs the credit of making the solitary run which saved the Eccentrics from a shut-out. In the third inning he led off with a safe hit over second, then stole the second and managed to make his way home on an error on the part of Kilmer. Charles A. Miller of Johnstown umpired both games in a satisfactory manner. The score By innings as follows: Colonials…….10010—-2, Eccentrics……00100—–1. The interest apparently centered in the first game for as the afternoon waned and the skies clouded over, many hiked for their homes, fearing a shower, the second game between the Colonials and Fort Johnson teams was called, the line-up of the Colonials being the same as in the first game. The Fort Johnson line-up follows: John Barnes, cf: F. Van Brocklin, 2b: Spencer K. Warnick 1b: Burtiss Deal, p; W. H. Bell, rf; Theodore Van Heusen, 2b; Lacy, ss; W. J Becker, c; H. Palmer, lf; The score by innings was as follows: Colonials……21242—–11, Fort Johnson……01020—–3. 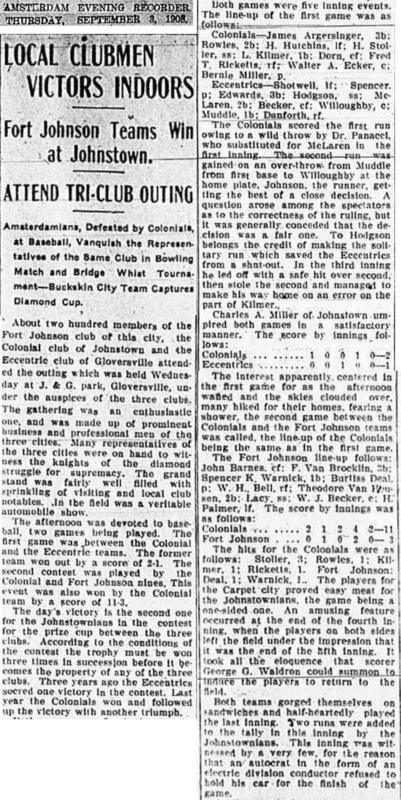 The hits for the Colonials were as follows: Stoller, 3; Rowles, 1; Kilmer, 1; Ricketts, 1; Fort Johnson: Deal, 1; Warnick, 1; The players for carpet city proved easy meat for Johnstownians, the game being a one-sided one. An amusing feature occurred at the end of the fourth inning, when the players on both sides left the field under the impression the it was the end of the fifth inning. It took all the eloquence that scorer George G. Waldron could summon to induce the players to return to the field. Both teams gorged themselves on sandwiches and half-heartedly played the last inning. Two runs were added to the tally in this inning by the Johnstownians. This inning was witnessed by a very few, for the reason that an autocrat in the form of an electric division conductor refused to hold his car for the finish of the game.